You've been told to go down to the second-hand shop and find £60 to buy a computer. Starting in your own bedroom, you search the house collecting £1 coins and avoiding the enemies that wander about the rooms. 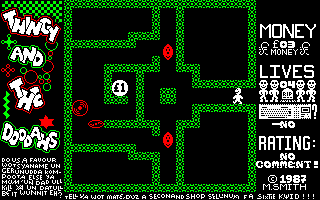 Then it's off into the garden and the forest, through to more sets of mazes, more coins to collect, and more enemies to avoid. It's a really simple kind of game with awful graphics that look as though it's written in BASIC (although it isn't), and the less said about the tune, the better. It's a game that will only be remembered for its extremely silly name. This is a board game for two players using a 6×6 grid. Each player must try to align four of their counters in a row either horizontally, vertically or diagonally. 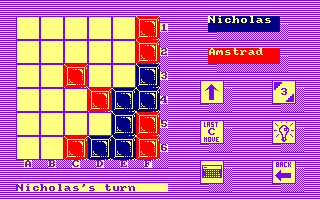 However, instead of placing counters on to any tile, a counter must be pushed on to one of the squares at the bottom or right of the board, and all the other counters in that row or column are shifted upwards or to the left as appropriate. The rules are very simple, but it makes for an extremely challenging game which requires a lot of thinking – hence the name. There are several different modes of play, including a tutorial mode and several problem-solving puzzles in which the board is already laid out for you. This is an excellent game for the intellectuals out there. Thomas has to complete seven tasks, such as taking oil to a refinery, delivering letters to the nearby city, or taking some children to the beach. You've got to find the carriage first and reach your destination before sunset. On the easy mode, you won't face any dangers apart from the odd train, and it's easy to complete. However, the so-called normal mode sees you facing more trains, as well as blocked tracks, and since it's far too difficult, you won't be playing this game for too long once you've completed the easy mode. The graphics and sound effects are mediocre, too, although the rendition of the theme tune on the menu is welcome. Enter the boxing ring and defeat six fighters (including one called Roland!) 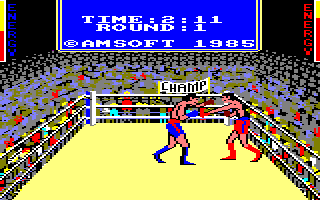 to become champion and win the Amsoft belt. In each round, you have three minutes to knock out your opponent. The graphics aren't bad and the fighters are large and well animated. A jolly tune plays on the menu screen, but the game itself is limited to a few sound effects, and some of these are rather poor, particularly when one of the fighters is hit. Playing the game is quite frustrating; the controls are awkward and punching your opponent is tricky. The collision detection is inaccurate, and your opponent can randomly land a knockout blow on you, regardless of how much energy you have. Stranded at the bottom of the sea, you must find or construct a submarine that will rescue you and take you back to the surface. The sea bed is littered with objects that you can collect. Some of them are hidden from view by larger objects that can be pushed out of the way. You will also find Eric the Eel, who can squeeze into gaps that you cannot fit into – but watch out for the octopuses, who will steal your oxygen tanks if you're not careful! This isometric arcade adventure with some lovely graphics and a pleasant rendition of a tune that will be familiar to British ears. However, the controls are awkward, and it's quite difficult to work out what you're supposed to do with the objects you can collect. Once again, you must save the Earth from evil aliens. 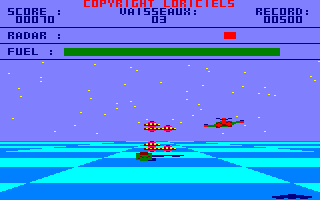 Flying over a blue chequered surface, you'll have to destroy waves of hostile spaceships. Well, as with many games containing "3D" in their title, we shouldn't expect much of this game. First, it is very difficult to aim accurately at the incoming aliens because the perspective is rather deceptive. Then, you have to collect fuel (by firing at it!) very often, which makes your task even harder. You'll soon be lost in a cloud of enemy bullets (or whatever it is), trying to find an oil tank – and you'll press the CONTROL, SHIFT and ESCAPE keys! 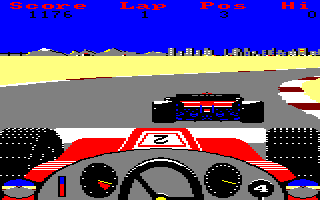 This early Formula 1 game sees you racing around eight tracks. In order to qualify for the next track, you must finish third or higher. After playing for a while, it's clear that this is much more of an arcade game than a proper motor racing simulation. Although you start on pole position on a grid of 23 cars, other cars will appear randomly in front of you even if you're in the lead and on the first lap! Despite this, it remains a fairly enjoyable game after all these years, and you get a sense of speed while driving around the tracks. 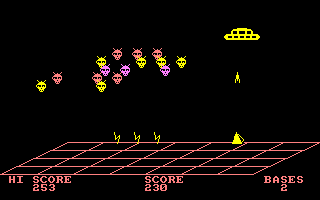 It's Space Invaders in 3D, would you believe? 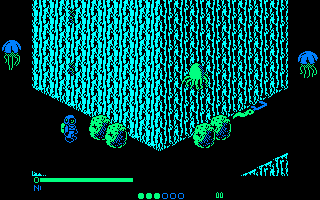 The Quarks are invading and you have to shoot as many of them as you can. You move your laser cannon about a grid of squares and try to dodge the aliens' fire as they move slowly – very slowly – left and right. It's really difficult to aim your laser at the aliens and your laser bolts nearly always seem to go right through them. The game is mostly written in BASIC and so it is excruciatingly slow, and the graphics, sound effects, and of course the game itself, are all abysmal. 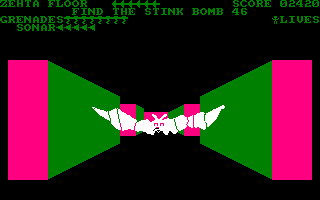 Hunt through three floors of a maze to find a key, then use it to disarm a stink bomb (! ), and return to your home base. There are seven keys in total, and you must also beware of the bat that flies round each floor, although there is a supply of grenades you can use to kill it. This game ranks as one of the worst I have ever had the misfortune to play. It is horrifically sluggish, and pressing keys often does nothing. 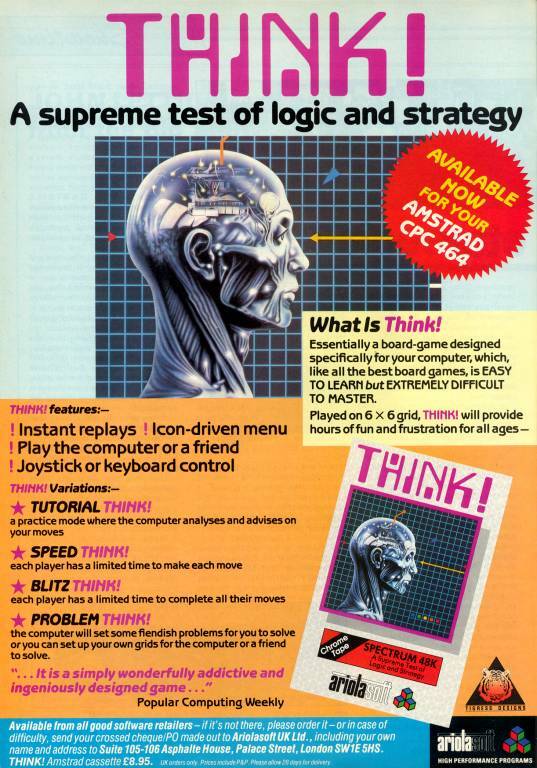 The graphics are equally terrible, and the game is extremely boring, anyway; playing it for more than two minutes will seriously test your sanity! 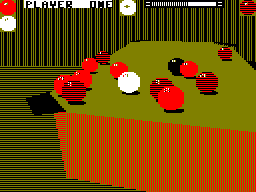 The problem with most snooker and pool games is that you can't move around the table, but you can in this game. You can take part in a tournament against several other players, all battling to face the champion, Maltese Joe. Alternatively, you can practice, or even try out fifteen trick shots – you can design your own as well. The 3D nature of the game makes it a little difficult to aim your shots, and it isn't helped by the other players being pretty good. The graphics are blocky and a bit slow, despite the four-colour, medium-resolution MODE 1 being used, and there are hardly any sound effects and music, but it's still not a bad game.